Have you ever thought about what it would be like to run an Airbnb? My husband and I have been doing so for the past two years, and we have learned so much in the process! I thought I would share about our experience to get you thinking about whether you might like to run one also. My husband originally had a photography studio next to our garage. He worked in studio and wedding photography for several years. Eventually, he decided that studio photography wasn’t really for him. (We had lost all of our weekends, and we really wanted them back.) Therefore, we had a giant open space next to our garage that no longer served a purpose. The immediate and obvious choice was to open an Airbnb in the space. We live out in the country, however, we’re close to popular tourist destinations. Saratoga Springs has a performing arts center and a race track, and many other attractions. Therefore, we thought that we might be able to attract some people to our space. The original studio was just a giant room, so we had to hire a contractor to build a bathroom. Eventually, our contractor convinced us that a mini-kitchen should be included also. He was right! The kitchen provides folks with the option to eat in if they want to save a bit of money. The kitchen has definitely served as an attraction to people who book our space. It took several months to have the bathroom and the kitchen built. Obviously, at that point, we were pouring a bit of money into the new space, and we had no idea if it would work out in the end. We were nervous as to whether anyone would actually want to stay in our location. It turned out that our nerves were unfounded. The day we listed our Airbnb, we had our first booking. We were dumbfounded when the notification popped up on our phones. Now, since we’ve been running our Airbnb for two years, we’ve learned a bit about the process along the way. 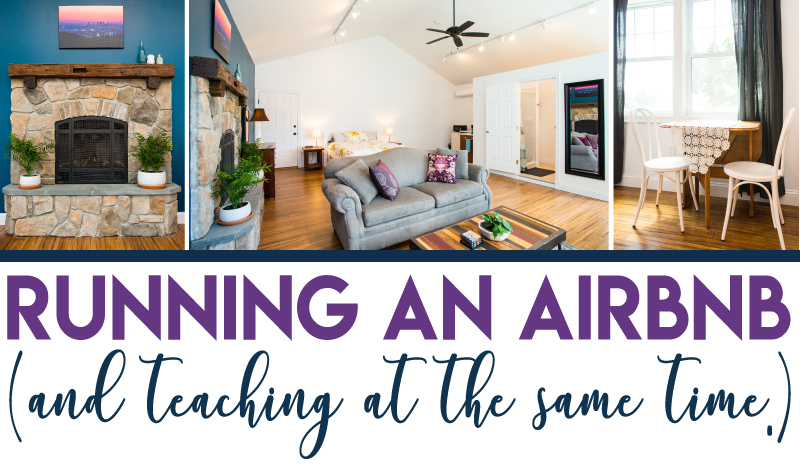 With the help of my husband, I’ve developed a list of tips to help get you started on your Airbnb journey. Airbnb wants you to be booked every single evening, as that’s the way that they make more money. I’ve found that their pricing guide is set way too low. We don’t find it worthwhile to rent out the Airbnb if we’re only going to be making 40 dollars an evening. Therefore, it’s better to look at other listings in the area to see how they’ve set their prices. Honestly, I don’t know if it would be worth it for us to run an Airbnb if we had to drive every time we needed to clean the property. With our current situation, we merely have to pop on over and bring supplies back and forth from our pantry. We couldn’t do that if there was a drive involved. I’ve read some blog posts that suggest that this isn’t necessary. I disagree. If you live right next to the guesthouse, the guests expect a quick hello and meet and greet. On the rare occasion when we haven’t greeted our guests, we will often receive a slightly lower rating. Guests are less likely to downrate you if they know what your face looks like and that you’re a human being. We’ve even had guest come up to our porch to introduce themselves because they want to meet the faces behind the rental. I promise, greeting your guests is important. We have a basket of snacks in our guesthouse and some toiletries in our bathroom. We also have some local magazines and brochures that advise guests about the area. Folks always comment on the ammenities in reviews so I know that they notice that difference. It’s only costs a small amount, and it adds so much value to the listing. People love to know that they can wake up and make a morning coffee without having to run out to the store. 5. Have signs that explain everything – even the obvious. Our shower requires you to turn the handle to get hot water. We included that information in our welcome sign because we had many messages about only getting cold water. A thermostat controls the gas fireplace. We had to place a sign next to the thermostat because folks were breaking into the fireplace trying to figure out how it works. We’ve even had couples run the heat and the air conditioning at the same time (yep). We now have a handy-dandy sign that greets everyone right as they enter. We advice all the guest to read the sign over when first arrive. It has alleviated most of the issues. My husband is a professional photographer, so it was easy for us to have professional photos. However, Airbnb will send you a professional photographer if you ask. Professional photos make a huge difference is getting potential guests to click on your listing over another location. Sometimes you might need a break. Personally, I can’t clean the guesthouse in the middle of the day, so if I know my husband won’t be available to clean, I do have to add in a space to do so myself. Sometimes, my husband and I just want a weekend away without having to worry about what the studio looks like. It’s really okay to take a break. I’ve found that really complicated inquiries never book and really simple inquiries do. If someone just wants to know if they can park two cars, respond to that inquiry fast! In contrast, if an individual wants you to tell them all about the area… that person is just fishing. I have the Airbnb app on my phone, and inquiries come right through. Having a coded door entry has made the process of checking in new guests so much simpler. We just change the code after each gueststay. No keys to lose or hand out, and guests can check-in even if we’re not around. 99% of our experiences have been positive. Two years later, we’re really glad that we invested our time into starting up our Airbnb. As an added benefit, it’s really helped us to keep up our own home. You don’t want the lawn growing tall or paint peeling if you are renting a guesthouse right next door. As a teacher, it’s a great boost to that summer income. Most of our bookings happen in the summer and I’m available at that point to clean and maintain the guesthouse on a daily basis if needed. I know that it’s not possible for everyone, but if you have extra space you’re paying for in your home, you probably have a space that could be utilized as an Airbnb rental. You can rent as often or as little as you like. You might only want to book one weekend a month. That booking can pay your cable and electric bill! People are looking to rent in all types of areas – in big cities and in the middle of nowhere. If you have any questions about running an Airbnb, please feel free to post them in the comments below.